I am now convinced that when it comes to game design we get stupider as we get older. This was made very clear to me the other day when my 3-year-old nephew spent a sick-day at my house. Apparently you're not allowed to go to daycare when you're still contagious, and both his parents have real, go-to-the-office jobs. So little Carter got to play with Aunt Wendy, who works on videogames from home. The day went pretty much as you'd expect - chase the dogs for a while, haul the cat out from under the bed, go for a walk, put a puzzle together, color in a Spider-man coloring book. We were having a good time, but I was starting to scrape the bottom of the barrel when I faced the inevitable "Let's do something else." Finally the obvious hit me. Let's play some videogames! I grabbed the first one off the top of the pile and put it in the PS2. Star Wars: Battlefront it is. Carter's father is a proper geek and has instilled in his children an appropriate adoration for all things Star Wars, so we were off and running. I started a new game and set it to "easy." This kid's too smart to try the old "Here, hold this controller while I play the game" thing. 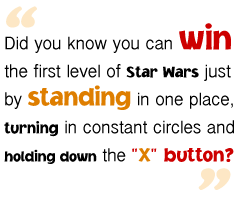 Did you know you can win the first level of Star Wars just by standing in one place, turning in constant circles and holding down the "X" button? Aunt Wendy got something right. He was thrilled. And when he heard the cheerful chimes, a signal to those of all ages that you've won something, there was jumping around and fists in the air and lots of shouting I didn't understand. But then the next level came up, and things started to go downhill. The instant it began he looked confused. It took him a few seconds to put it into words, but then he said it. "I already won this level." I looked at Star Wars with new eyes. This truly was level 2. He really had won the first level. No cheating there. But the lovingly-rendered background and setting didn't look all that different from the first level. Honestly, how would I know this was a different level if I hadn't read the words on the screen? I picked out some very tiny details and showed him how it was different. He seemed unconvinced and was even more disappointed when he ran out of ammunition and couldn't figure out how to reload or change guns. It just wasn't intuitive enough. He was done. "How about a different game?" I tried. He was up for that, so I grabbed the next one on my pile and stuffed it in the PS2. Up comes Jak and Daxter. The cute characters caught my nephew's attention immediately, and he was quite interested. For a while. Then his face clouded over and he looked at me like, who are you trying to fool?